Well, Signs of the Dates to be precise. 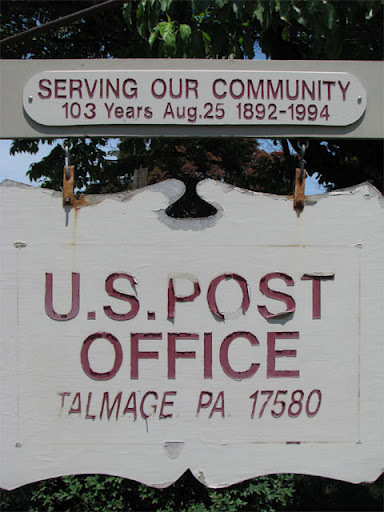 In exploring the rural post offices of Pennsylvania I came across several offices which, under POSt"Plan", are slated to become two-hour PMR-operated locations. Each was being studied for closure under RAOI last year. Each also has another nice aspect: the sign for the post office tells us just when it was established. It's a mark of pride to the town that they've had an operating post office since the early 1800s; May 30, 1818 to be precise. Located in a photogenic, hilly corner of PA, Fisher has the longest Saturday hours around: presently 9 a.m. - 3 p.m. Yet I still couldn't find my way there the first time I tried to find the town nearly three years ago. I caught up with Fisher one Sunday morning last autumn; the post office is housed with the general store. The sign notes that the location was established August 20, 1860. A house and real estate office share a building with the Cambra post office, which has a fantastic hand-painted sign declaring its date of establishment -- 1822. The thing about this blink-and-you-miss-it post office, located within a mile of the Brownstown P.O., is that you'll probably miss it even while staring right at it. It's located at the side of a house obscured by hedges. The only indications are the pole-mounted collection box -- which looks like you could pick it up and spirit it away (you can't; trust me), and the sign. At least it's a sign with character. Now this is what I'm talking about: "serving our community". This one was fantastic. Jersey Mills is located in a dispersed string of three post offices along the Pine Creek Gorge northwest of Williamsport; other POs are Waterville and Slate Run. Each was an RAOI office last year. The Jersey Mills location was incredibly photogenic, sandwiched between the main road and a bike trail used by locals and tourists alike. There's a sign facing either line of traffic. And it's a good thing, too, because if it weren't for the sign, you'd just see an ordinary-looking red house with a worn driveway. Where's Ben Franklin when you need him. Time to take the country back to real human and public service, not all this technology. New isn't always better. The best stuff is being forgotten. Gotta love that mossy roof and grassy driveway, in addition to the old fashioned collection box! Beautiful post office! I like your photos, Evan.